Marvin “Marvelous” Sonsona is the new NABF Featherweight champ after defeating Wilfredo Vazquez Jr of Puerto Rico last Saturday night in New York. He outpointed and avenge his only loss of his career from the same fighter who conquered him and ran away with his WBO Flyweight title almost 5 years ago by knocking him out on the fourth round of that fight. Many Sonsona fans, especially Filipino fans were disappointed and had crushed-hearts when he lost to Vazquez on their first bout because the fighter from General Santos, Philippines was being tagged as the next Manny Pacquio. Intriguingly, Sonsona and Pacquiao hails from the same province and were both considered as knockout artists of General Santos province. After that loss, Sonsona bounced back by winning his next four bouts with 3 of them by way of knockout. He currently holds an impressing record of 19-1-1 and 15 of those coming by way of knockout. One of his victim was a tough boxer and allegedly was Japan’s next boxing hero, Akifumi Shimoda whom the Filipino boxer annihilated in 3 rounds last February of this year to capture the WBO International Featherweight title. 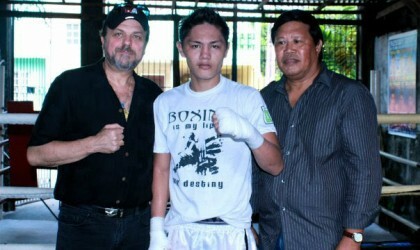 Sonsona’s fans once again had that hope that the Filipino kid will live up to his nickname and will soon be the next boxing icon after the win against Vazquez. There are news that HBO and Sammy Gello-Ani, Sonsona’s manager are in talks for possible big fights in the future for the once again rise of the kid to stardom. This would mean a possible title crack against Featherweight champions on the likes of Jhonny Gonzales who currently holds the WBC Featherweight belt and Nonito Donaire who ironically is also from General Santos, Philippines, the current WBA Featherweight champ. One big question arises though, is Sonsona physically and mentally ready for another crack at the title? Was the victory last Thursday a convincing win? Sonsona’s team should not rush the kid because even with his win last Saturday night, his conditioning was put into question. The gasping, holding and embracing 3rd round onwards is not a sign of good conditioning. Better take it one step at a time. Sonsona is just 23 years of age and has a great career path ahead of him if well handled.